Explore your creativity and create unique sounds. The Dreadbox EREBUS V3 Duophonic Analog Synthesizer is a comprehensive desktop synth, featuring numerous upgrades and enhancements from version 2. The EREBUS V3 Analog Synthesizer builds on the design of version 2, adding a third oscillator for improved sound design capabilities. The ergonomic layout also includes a built-in 12dB resonating multimode filter and dedicated ADSR envelope. One of the most unique features is the auto-tuning function which keeps your oscillators tuned to perfection. You can generate a wide variety of sounds using the EREBUS V3, from atmospheric pads and textured sounds to brash basslines and cutting-edge leads. It also includes 36 patch points, so you can use the synth with a variety of external modules and synths. The Dreadbox EREBUS V3 Duophonic Analog Synthesizer builds on the success of the two previous versions. Version 3 features a total revamped design with an additionally oscillator making a total of three. The three voltage-controlled oscillators add a new level of sound design to the synth. Also included is a 12dB resonating, multimode filter and up to three LFOs. A white noise generator is included for creating harsher sounds, ideal for creating leads and basslines. It also features a lo-fi echo/delay effect for adding texture to your sounds. A patchable Sample and Hold circuit is perfect for live performances, allowing you to create glitches, patterns and rhythms on the fly. The compact and sleek design makes it perfect as a desktop synthesizer. It features an ergonomic layout with a wide range of patch points, which you can use to incorporate external modules and synths. The duophonic synthesizer features analog circuitry, delivering classic warmth and grit. One of the most cutting-edge features is the inclusion of automatic tuning. Analog oscillators can go out of tune after a while, which then requires you to tune them manually. With background automatic tuning, the EREBUS V3 ensures your oscillators remain in tune at all times. Another unique feature is the triple ring modulator. The modulator provides a trilogy of effects, basing it on the Ring Modulator circuit. The different types of modulation allow you to get in-depth with your sound design. The wide range of parameters and controls allows you to create virtually any sound you can think of. The only limit to your sound palette is your creativity. Explore your inspiration today and create unique sounds with ease. The multimode filter allows you to change the style and tonality of your sounds. The filter can operate in either high-pass or low-pass modes. The 2-pole state variable design comes complete with a Cutoff and Resonance knob, complete with a Mode slider for balancing between the high pass and low pass filters. The filter can even self-oscillate when turns above 3 o' clock. The dual ADSR envelopes providing shaping capabilities for both the VCF and VCA. The ADSR envelopes are the only digital part of the synth, for use with the filter and amplifier sections. The first envelope is hard-wired to the filter cutoff. It can also be patched to modulate external sources for added flexibility. A second envelope labelled ‘Amp’ controls the voltage-controlled amplifier and the corresponding patch point. They are represented by precision, high-grade sliders for controlling the Attack, Decay and Sustain levels. There is an additional Loop switch on the envelope section which sets the envelope to loop from the end of the release stage. The EREBUS V3 includes the ability to access up to four separate LFO sources. The dedicated LFO section features a triangle wave, which can be patched from patch point seven. Without being patched, the LFO will modulate the frequency or pitch of all the oscillators. It includes both Rate and Depth sliders for controlling the LFO. 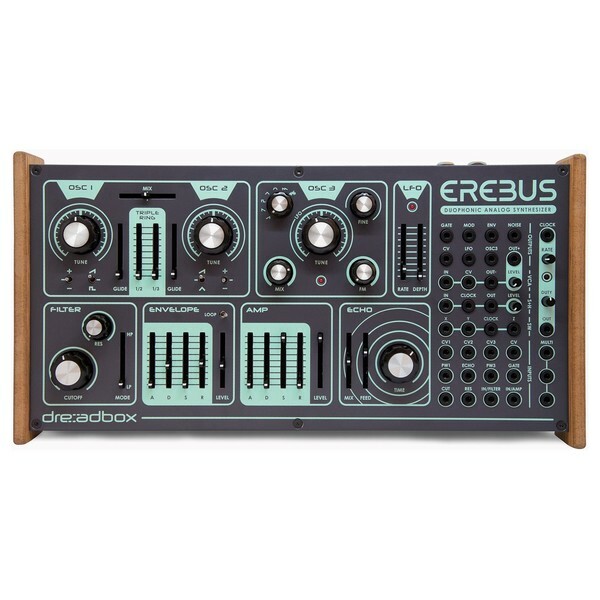 With a wide range of analog and CV connectivity, the EREBUS V3 allows you to interact with various external modules and synths. The synthesizer boasts 35 patch points in total, offering endless routing and modulation possibilities. The patch bay is comprised of seven major parts: general inputs, general outputs, VC analog wide range clock, VC amplifier/attenuator/inverter, sample & hold, analog switcher and multiplier.